It’s January and here comes the fun! While we wait for the Big Tent, there’s still plenty to do and enjoy. 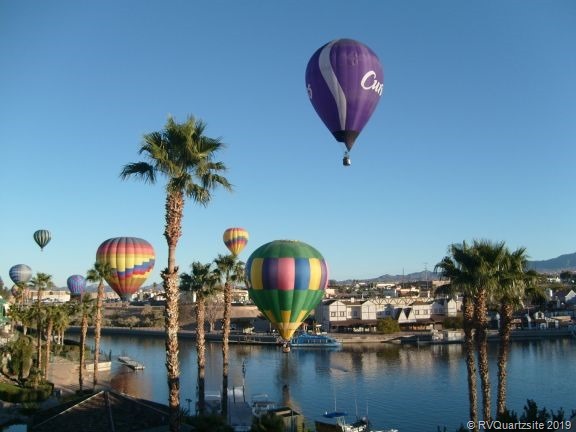 Up in Lake Havasu City, we have the annual Quilting At The Lake starting tomorrow and starting Thursday through this weekend is the Havasu Balloon Festival and Fair. If you haven’t seen this festival yet with brightly colored balloons flying over London Bridge, you really should make the time to go see it. It is AWESOME! The fair nearby has lots of great food and vendor booths as well as flying demonstrations. If you have never flown in a balloon, this is your chance! In Quartzsite on Saturday we will be having the annual Hi Jolly Daze Parade. For those of you new to Quartzsite, Hi Jolly was a camel driver who came to Quartzsite to help with an experiment in using camels as beasts of burden in the American desert. The experiment failed. Hi Jolly moved to Quartzsite in his final years and is buried in the local cemetery with a very large grave marker you should also see. If you are into geocaching, check your geocache app before going. Also on Saturday, the New Christie Minstrels are back to entertain the Quartzsite crowd at the QIA. They do two shows that are very much worth seeing.